At the end of Winter snow that has accumulated on the roof goes through a cyclical process of thawing then freezing and then thawing again which spreads and separates layers of roofing materials such as tar paper, shingles, wood and the insulation that form the protective barrier between homeowners and the elements of winter. Once these layers spread from the expansion of ice, they are then susceptible to leaks when the same water thaws during the day or from the temperature inside the home radiating outwards. A well heated home where icicles have formed on the eaves is highly likely to form an ice dam. After and ice dam has caused the spreading of the roofing materials, it can then create an entry for the continuously melting snow and ice to enter the home. This happens when the water that builds up behind the dam seeps through the cracks created by the expanding ice and into the home. Once inside, water will follow the cue of gravity and flow out from ceilings and into bedrooms and living spaces. If an ice dam has caused water to flow into a home it has also undoubtedly soaked the drywall and insulation materials which then become waterlogged and rotten. 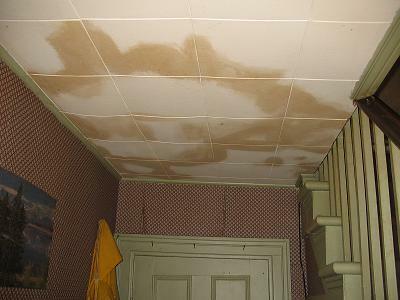 Then these wet materials create a breeding ground for mold spores and fungus infestation. Mold and fungus follow in short order behind an ice dam when spring arrives and they can make a home look ugly, smell musty and potentially even cause health problems for those living in it. The first step to ensuring you don’t have an ice dam form on your roof is to clean out your gutters and downspouts after fall but before winter hits. This way all of the leaves and debris in the gutters won’t form blockages that prevent snow meltwater from properly draining. Second, don’t allow snow or ice to accumulate on your roof in large quantities during the winter. This may mean that you require roofing or restoration professionals to clear off the snow and ice during the winter. Finally there are heating cables specifically designed for gutters that go a long way in preventing ice dams from ever forming, but they must be installed before winter hits and also require well-groomed gutters and downspouts to perform properly.